“Garanteed-b’y,” Ralph backhands me with a light slap while chortling a deep, raspy smoke-enhanced laugh. Blame it on The Bird Artist and The Shipping News, but Newfoundland conjures up images of codfish and four-pound lobsters, oilskin-clad fishermen and ramshackle houses perched precariously on cliffs, icebergs and gale-force winds. But alpine skiing? On an island in the Atlantic Ocean? Arn! Flat on the back for that! The skiing isn’t quite as quirky. Marble Mountain rises 1,700 feet from the Humber River, prized for its salmon (70,000 swim upriver annually) to just below what locals call the Governor’s Balls, two gigunda rocks overlooked by a Doppler radar tower. Views extend down river to Humber Arm and out to the Bay of Islands, framed by the alluring Rubenesque Blomidon Mountains, a line of rounded, downy peaks, all curves and cleavage, descending to the sea. The terrain surprises me. Wispy intermediate trails and a lone lollygagging green frame a steep, muscle-bound black core. Aptly named Corkscrew drops, rolls and twists, begging to be skied again and again. It’s one of the best-designed and most delightful trails I’ve skied, anywhere. 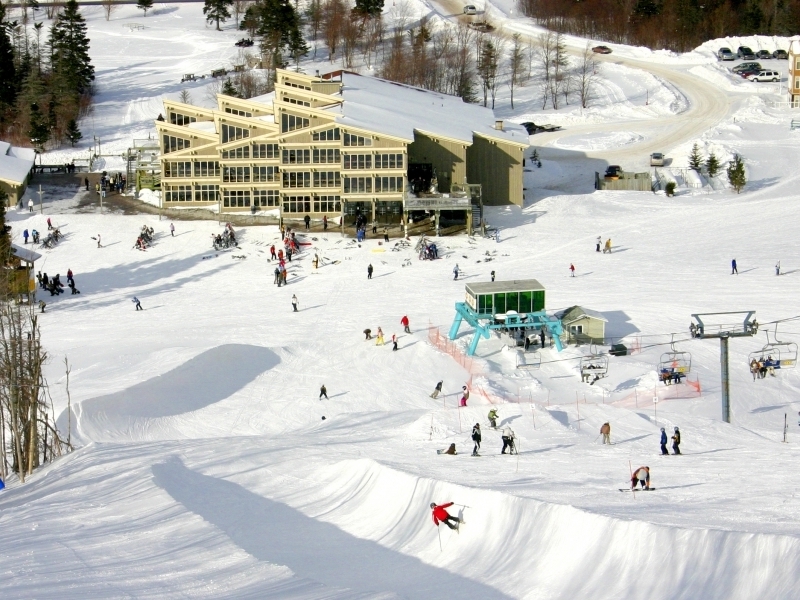 Boomerang is not only steep, but also narrow and choked with cliffhanger moguls. Another plus: Thanks to the sparsely populated region combined with limited lodging, weekend lift lines might be all of five minutes; midweek, they’re nonexistent. I reward my efforts with a lunch of artery-busting poutine: French fries smothered with gravy and cheese curds. Marble specializes in the Newfoundland version, which adds hamburger to the mix. Of course, there are always cod cheeks. Mmmmm: Pucker up! Tags: Marble Mountain, Newfoundland, skiing. Bookmark the permalink.